for the celebration in Rome. As a deacon ordained and incardinated into the Archdiocese of Washington, DC by one of his predecessors, Cardinal James Hickey, I am one of the new Cardinal's deacons, even thought I'm currently serving outside the Archdiocese. I had first heard of Father Wuerl when, around 1976 or so, he co-authored a very helpful textbook which summarized Catholic teaching. 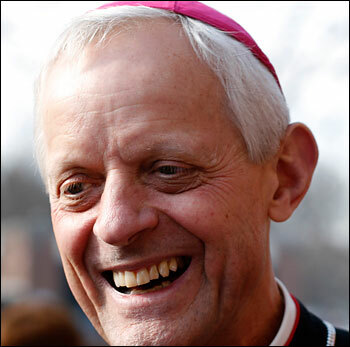 Later, as newly-ordained Bishop Wuerl he was assigned as auxiliary bishop to Archbishop Hunthausen in Seattle during a very trying time in the life of that local church. He was then "translated" (as the official lingo has it) to be the diocesan bishop of his home diocese of Pittsburgh. I first met Bishop Wuerl during that time. I was part of a team preparing a text for the United States Conference of Catholic Bishops now called the "National Directory for the Formation, Ministry and Life of Permanent Deacons in the United States." A number of bishops were involved in the process, and seven of us (known by the bishops and others as "the Gang of Seven") were charged with coordinating major pieces of the document. I was originally asked to coordinate the drafting of the section on "diaconal spirituality." But the real problem was encountered in trying to write a summary of diaconate theology. The church simply had not written all that much on the renewed diaconate, especially in the mid-1990's when we began working on this project. After nearly two years of wrangling, we were still at an impasse. I was asked to step in as a kind of "troubleshooter" or "negotiator" between a couple of differing views being debated for inclusion in the text. At this point, a new chairman of the committee on the diaconate was elected: Bishop Gerald Kicanas, now of Tucson. He thought it would help if we could get some other bishops involved (we already had about 15 bishops involved!) who had worked on a similar document on the priesthood. So he invited Cardinal Maida of Detroit and Bishop Wuerl of Pittsburgh to serve as "episcopal consultants" to the process. At our very next meeting, Bishop Wuerl and I sat next to each other and began a very interesting dialogue on what we COULD say in the National Directory about the diaconate, and what we couldn't say, since we would just be offering theological speculation; a document from the USCCB shouldn't engage in theological speculation, which is the job of theologians. Bishop Kicanas asked Bishop Wuerl if he would agree to draft a chapter outlining the theology of the diaconate based on current church teaching. Bishop Wuerl agreed, but asked if I would work with him on it. I was somewhat surprised to be asked, and honestly, I thought he was simply being courteous. On the contrary, what followed was a most fulfilling part of the whole experience. We would each draft a section and then fax each other what we had written. We would then critique each other's work and do it again. In several exchanges, a workable chapter on the doctrine of the diaconate was written. What I'll always remember about this experience is the truly collaborative and congenial way in which this modest partnership took place. 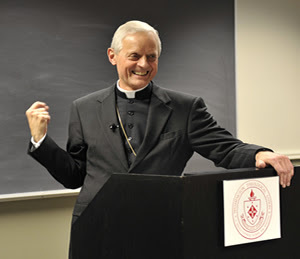 Bishop Wuerl really didn't need me to work on the text, but he treated me as an equal partner in the process and that was refreshing and most appreciated. It was also very productive. We have bumped into each other on various occasions as we've addressed the same groups: the National Organization for the Continuing Education of Roman Catholic clergy, a church leadership conference in Washington, and so on. Invariably, he recalls our collaboration, as I do, with fondness and generosity. So, congratulations, Cardinal Wuerl, from your former collaborator on the National Directory and one of the deacons of the Archdiocese in which you now serve. Ad multos annos!